Christmas is right around the corner and let’s face it; there are a number of expectations to uphold during the holiday seasons. Is your tree up to standard? Are your Christmas lights tastefully placed? Is your eggnog worth another taste? Are your presents perfectly wrapped? We are all naturally uptight when it comes to creating the perfect holiday atmosphere, which is absolutely fine because from “uptightness” comes perfection. It’s no wonder that the world looks more beautiful and people are happier around Christmas time. But then again we aren’t perfect. Every year, my little sister places a bowl of chocolate chip cookies and a glass of milk for Santa and every Christmas morning she wakes up with the satisfaction that Santa loved her store bought cookies so much, that he just left crumbs in the bowl. Little does she know Santa just so happens to be me who does quite enjoy that store bought chocolate chip cookie. But this year is going to be different; my sister wants me to bake original cookies for “Santa”. My idea of homemade gourmet food is Kraft Dinner but I’m on a mission this Christmas is to create the best, unique, baked cookies for Santa because even he needs a change from chocolate chip cookies once in a while and I need to look like I know what I’m doing in the kitchen. Here are Faze’s top three easiest cookie recipes that would easily fool your loved ones, and Santa, into thinking you’re a professional baker. Enjoy! 1. Preheat oven to 200°F with racks in the upper and lower thirds; line 2 large baking sheets with parchment. 2. Using an electric mixer on medium speed, beat whites until foamy. Beat in cream of tartar, then gradually add 2 Tbsp. superfine sugar; beat until soft peaks form. Add 1 Tbsp. superfine sugar and increase speed to high, beating until stiff peaks form. 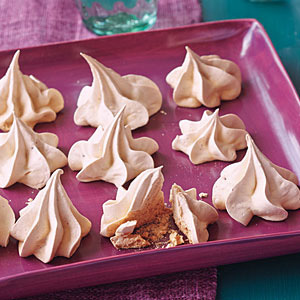 Gradually add remaining superfine and confectioners’ sugars, and beat until meringue is stiff and glossy, 3 to 5 minutes longer. Beat in vanilla and cranberry sauce. 3. Transfer meringue to a pastry bag with a star tip. Pipe out 1-inch cookies onto parchment-lined sheets. Bake until firm and lightly browned, about 2 hours (do not open oven). Turn off heat and leave cookies to cool in the oven until very firm and crisp, about 1 hour. Cool completely, and then peel away from paper. 1. Preheat oven to 350ºF and line two rimmed baking sheets with parchment paper. Using an electric mixer on medium speed, beat butter and sugar until light and fluffy for about 3 minutes. Beat in egg yolk (reserve white) and vanilla. Reduce mixer speed to low and beat in flour and salt. Continue mixing on low until dough comes together in a ball. 2. In a bowl, mix walnuts and sugar. Roll dough into 1-inch balls, dip each in egg white, then roll in walnut mixture, turning to coat. Transfer to baking sheets. Using your finger, make a deep indentation in center of each ball. Transfer pans to refrigerator; chill 20 minutes. 3. 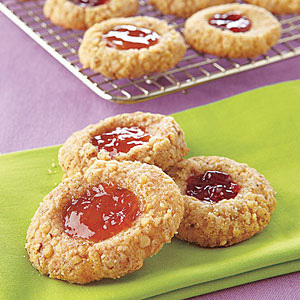 Fill center of each cookie with some of jam (do not overfill or jam will leak out while baking). Bake, rotating pans halfway through, until cookies are golden brown, about 10 minutes. Let cool for 5 minutes on baking sheets on wire racks, then transfer cookies to wire racks to cool completely. 1. Preheat oven to 400°. Unfold piecrusts on a lightly floured surface and roll to press out fold lines. Cut with a 2-inch, heartshaped cookie cutter. Reroll remaining dough and repeat procedure. (There should be a total of 46 pastry hearts.) Brush one side of each pastry heart with egg white and sprinkle evenly with granulated sugar. Place pastry hearts on two ungreased baking sheets. 2. Bake for 7 to 8 minutes or until lightly browned. Remove cookies to wire racks and let cool. Stir together cream cheese, powdered sugar, 2 Tbsp. butter and almond extract until blended. 3. 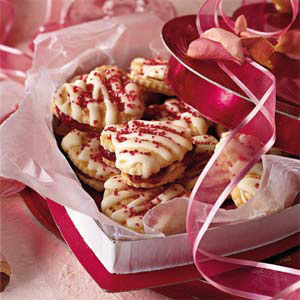 Spread cream-cheese mixture evenly over un-sugared side of half of the heart cookies, followed by about 1/2 tsp. preserves. Top with remaining hearts, un-sugared sides down. 4. Microwave white chocolate morsels and 1 Tbsp. butter in a glass bowl on high for 1 minute or until melted. Stir mixture until smooth; seal in a small, heavy-duty zip-top bag. Snip a tiny hole in one corner, then drizzle mixture over tarts. Cool completely; sprinkle with red sugar and place in candy boxes, if desired. Do you have original, never before seen, baked cookie recipes? Share with us at @fazemagazine on Twitter, Facebook and Instagram.